On their feet the ancient Egyptian wore sandals made of woven reed, grass or leather. The standers from consisted of a thing passing between the first and second toes and attached to a bar passing over the instep. In the Nineteenth Dynasty a style with an upturned toe appeared, a forerunner of the Turkish slipper. Among the earliest examples of this type are the delicate, red leather sandals found in the cosmetic chest of the lady Tutu, wife of the scribe Ani. 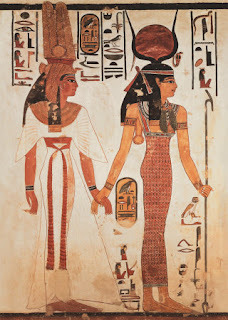 An integral part of Egyptian costume was a wig or hairpiece added to the natural hair. Many Egyptians shaved their heads or cropped their hair very short, although some did retain a full head of hair which they kept elaborately dressed. Sculpture and wall scenes show that there was a great variety of hairstyles to choose from , both for everyday wear and festive occasions. There does, however, seem to have been an element of idealization in the rendering of wigs, as there was in clothing, for surviving examples are far less elegant than their regular, sculpted counterparts. Wigs were made of human hair, although some vegetable-fibre padding was also used T. The wig illustrated has a mass of lightish curls on top and a multitude of thin, tight plaits below ear level. 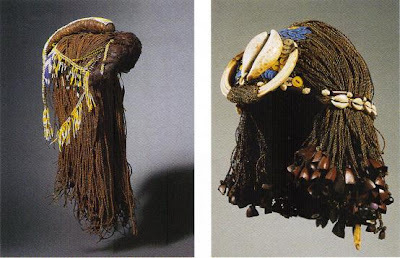 The foundation for these elements was a net woven of plaited human hair, with rhomboidal openings, The wig comprises about 300 strands, each of which contains about 400 individual hairs. These have been coated with a mixture of beeswax and resin,. To attach the strand to the net, some of the hairs were looped over the netting while the rest of the strand was whipped round the loop. This was then waxed to fix the strand in place. The melting point of the max is about 50 degrees Celsius, so it was unlikely to melt even on the hottest Egyptian day. The manufacture and care of these wigs, as well as the creation of elaborate plaited hairstyles, required either the specialist services of a hairdresser for those who could afford it, or the help of a friend for those who could cont. A number of scenes and figurines survive showing ladies at their coiffure. Pins rather than combs seem to have been used to arrange and hold the tight curls, although combs, both functional and decorative, have been found ion large numbers. the Egyptians were fastidious about the rest of their bodily hair, considering a hirsute appearance a sign of uncleanliness and personal neglect. The only exceptions to this were an occasional thin mustache or goatee type of beard on men. For this reason, the razor had a long history i Egypt , beginning in predynastic times . originally there were two types : an asymmetrical variety with a single cutting edge at the side, and a symmetrical , spatula-like type with parallel sides and a rounded cutting edge. The asymmetrical type soon fell out i use , but the spatula type survived and developed through a series of forms. The sides began to splay out, and during the Middle Kingdom the cutting edge began to protrude laterally. by the New Kingdom this had evolved into a hatchet-like form with a handle at a virtual right angle to the cutting edge and a spur projecting from the rear. This is thought to have served as a counter-weight to ensure proper balance in the handling. The exact mode of handling and method of working the razors has not yet been fully established. In the absence of soap, oil or unguent was probably used to soften the skin and hairs of the area to be shaved. Other types of implement were available for removing unwanted hair. Tweezers are known from the First Dynasty onwards , with both sharp and blunt ends for different tasks. There are also curious composite tools consisting of two metal elements pegged together with a pin. one element is straight-edged with a sharp point at one end , and the other has a flat blade and razor-like blade. These implements may well have served several purposes . It has been suggested that they acted as curling tongs, but they were certainly used as razors for close, delicate work. Where are those "ancient Egyptian" wigs from?